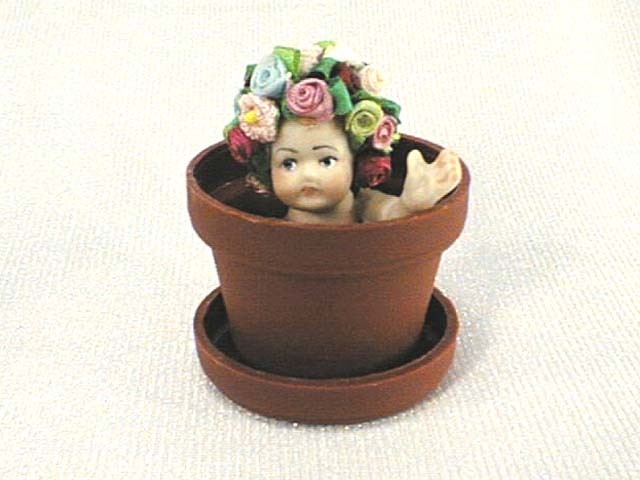 Baby Hilda is a tiny reproduction doll of the famous vintage mold of J. D. Kestner. 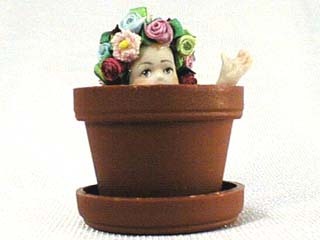 She wears many hand-rolled silk ribbon roses on her head and she is "firmly planted" in her plastic flower pot (that is, she's not removable ;-). She has not yet sprouted fairy wings, but maybe she could grow to be a fairy if you put the right kind of "water" on her. I've always wondered where fairies come from... maybe they grow in pots? 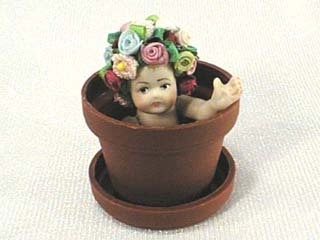 Hilda is only 13/4" tall by 11/4" wide, but she is guaranteed to put a smile on your face every time you get a look at her! Another wonderful, one of a kind work of art by the artist JoAnnJ of Galleria d'Juliani, and she is hand signed by the artist.